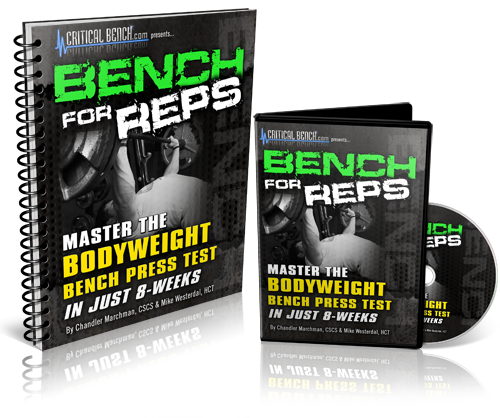 This Bench for Reps program is launching in just a few short hours. And as promised, I got an advanced copy of the program to give you a heads up on what you are gonna get. As always, Mike and Chandler delivered a quality program. The went over many aspects of benching that many coaches neglect. There is more to this program than just the 8 Week Challenge. They go into detail on proper form, some of these tips alone will add pounds to improve your bench. They also help you understand the way to address your weak points. Not only that, they show how to choose exercises to correct those weak points. Again these are things that most bench programs leave out. 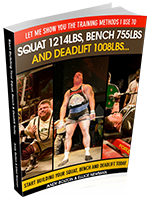 If you have hit a plateau, or are looking for something different in your bench press routine, this is a program worth checking out. As I said, the benefits of it will last you much longer than 8 weeks. The information on form, and rep schemes are something that you can continue to incorporate into your training .